Time for the 2019 calendars! 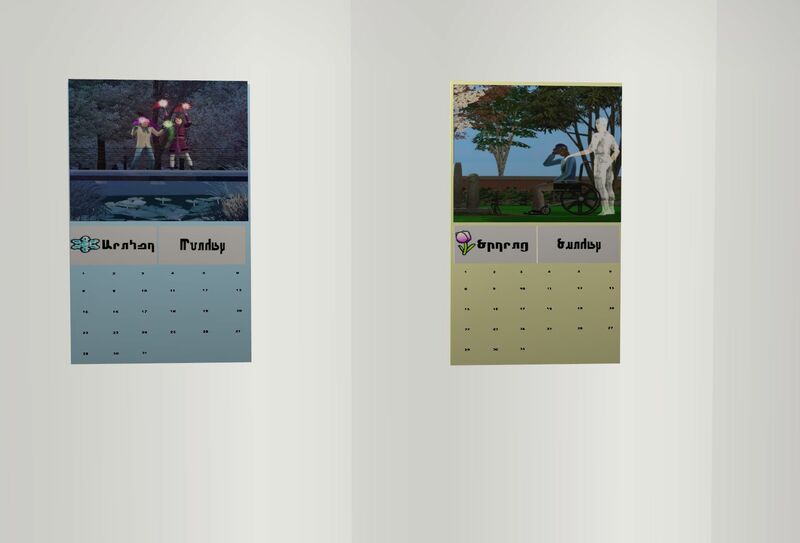 This year's calendars are clones of last years, but with this year's calendar contest winners. As the Seasons Calendar has 20 days in it, some of each season's days have repeats of the winners as only 12 winners were selected. The base game uses only the 12 months, so each picture is used only once. 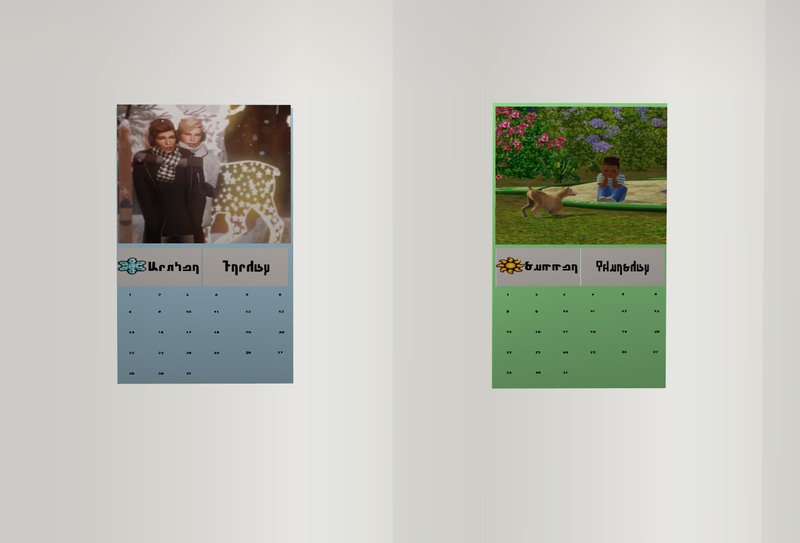 As the pictures's dimensions do not always perfectly match the textures for the calendars, some editing was done to the winners' pictures in order to get them to fit in the texture sizes allowed. So if you see some minor editing to the pictures as compared to the originals, this is why. One is for base game only, and one requires seasons. I cloned them from Inge's original one. You may have both of them, as they have unique guids. These are both shiftable if you have Apartment Life installed. First for the base game one. 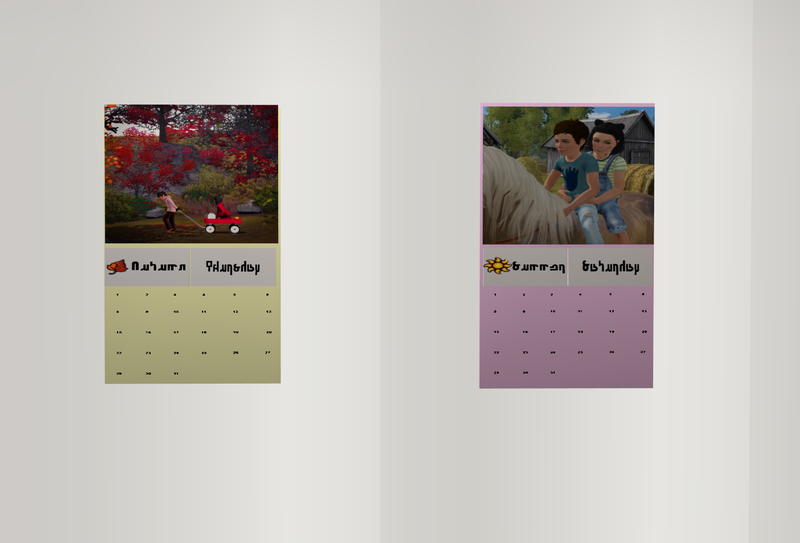 It changes months, like before, but it has the option of choosing between Northern and Southern hemisphere so the December/Christmas picture falls in summer for instance.. Also it is recolorable! When you first place it, it will just show it's MTS cover, with the lightbulb. You will have to choose Northern or Southern (as a toggle) to get it to start. Otherwise, it will change at midnight, and start the Northern path. Now for the Seasons version. It changes days through the year based on what season you are in, so it will know automatically if you are in spring, summer, fall, or winter. You have the option to toggle between seasons and quadrants as well as northern and southern hemisphere and holidays on and off. Quadrants is where the calendar will still go through the entire year, even if you have a hood that has 4 summers for instance. Just after changing, sync northern or southern accordingly to get it to reflect changes. It defaults to seasons still, as well as northern hemisphere and holidays off, so you will have to change it manually if you want quadrants. Also just like the base game version, this one has a Southern and Northern hemisphere as well. It too is recolorable, and has a holidays on and off toggle. You can also change the days as well on it. It starts out by default in Northern hemisphere, and with holidays off. If you change seasons, or wish to refresh the notification, just choose sync northern, or sync southern, and the page will refresh. The day changes at midnight, but the picture and season changes at 8 am. The holiday notifications, when on, will only show up once, at the beginning of the day around 7:40 to 8 am, when the day changes. Also the calendar will remember your holiday settings and your hemisphere settings. There are the same holidays in this one as last year. 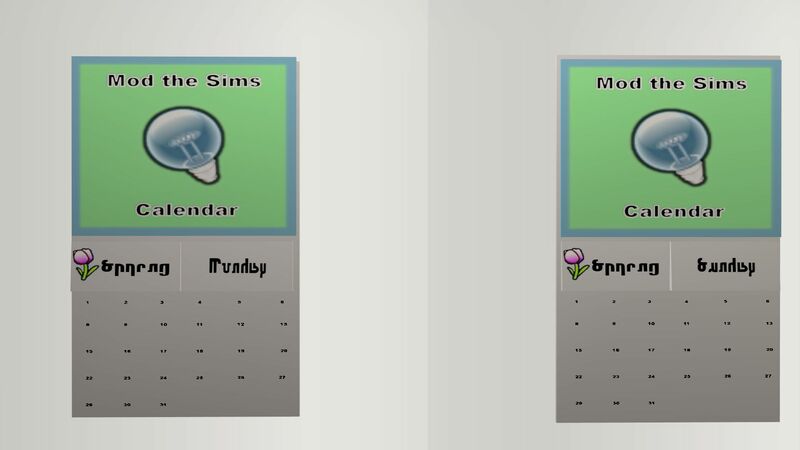 Some are based on familiar ones, like Christmas and New Year's and some are made up simlish ones, using familiar sims icons. The holidays do vary somewhat between northern and southern hemispheres, and some of the pictures do also. I used all the winners' photos, some more than once, so that if you see some of them more than once, that is why. 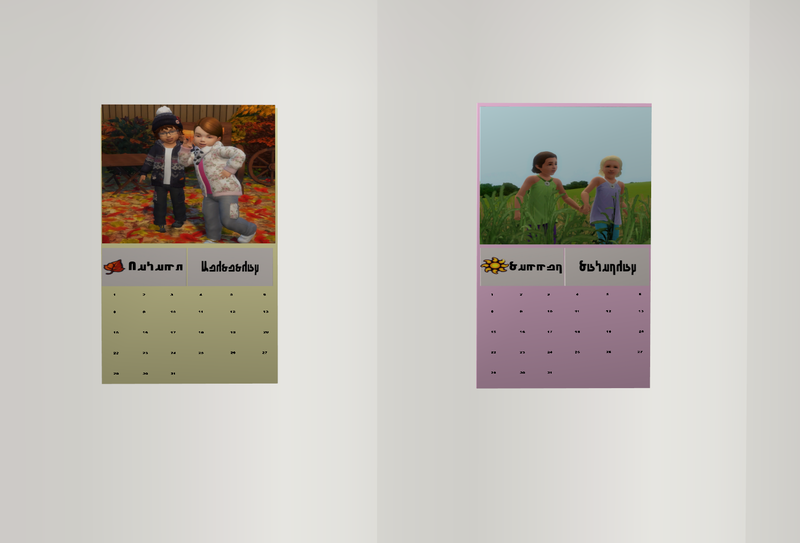 The calendar contest was a bit different this year, so this year we reused some of the winners' pictures for the various days instead. Some of the pictures had to be edited a bit to fit in, so if you see that one has changed somewhat that is why. Here's the list of holidays, and when they show up in the Northern and Southern hemispheres respectively. Elder's Day was suggested by Jones to give those poor elders some love. 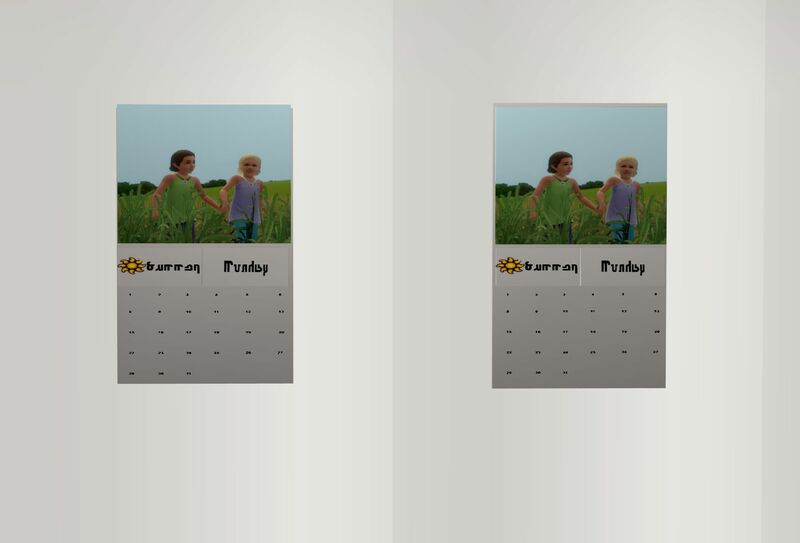 I created the textures, using EA's seasons symbols, and Fran's simlish simply there and of course, the pictures from the contest. I want to thank the winners of the 2019 contest. Both versions show up under decorative/wall hangings for 20 simoleans. This doesn't, to my knowledge, conflict with anything. 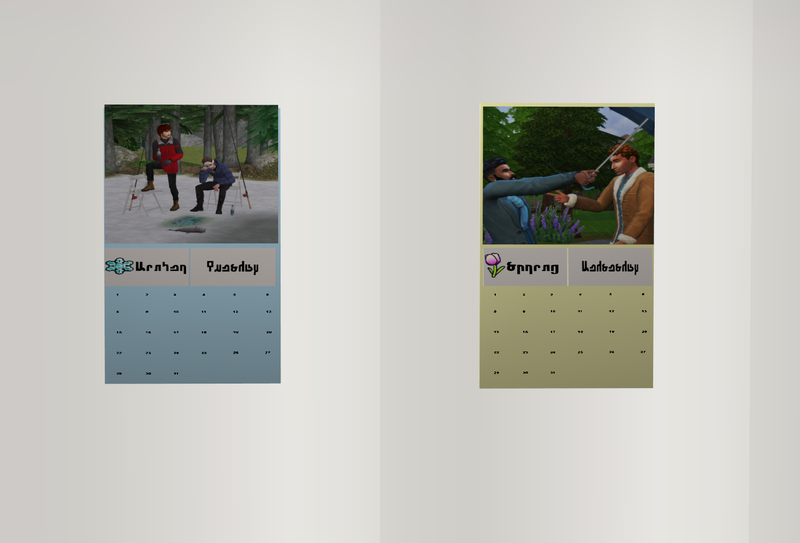 Also I wanted to thank the following people whose code I looked through and combined to help with creating this, and Phae, who came up with the concept of the original Seasons calendar with holidays included! Black_Spirit for the day code. and Sim Wardrobe's season and weather controller for the change season code. Since the site is now gone, I got the item from the simfileshare account bulbizarre has for his items.